Die-hard edition: 88 hand numbered copies with A4 insert (210 x 297 mm), A2 poster (592 x 420 mm) and 2 woven patches, one of each project. “In The Mausoleum” recorded by Anemone Tube 2007 and 2009 exclusively with field recordings made in Sun-Yat-sen-Mausoleum, Nanjing 2007, “From Anthropocentrism To Demonocentrism” recorded by Anemone Tube 2008 with field recordings made in Nanjing and Shanghai 2007 and additional synthesizer, final mix 2012. “1000 Tones” recorded by Ichiro Tsuji at UPD studios 2012. Mastering by James Plotkin 2012. 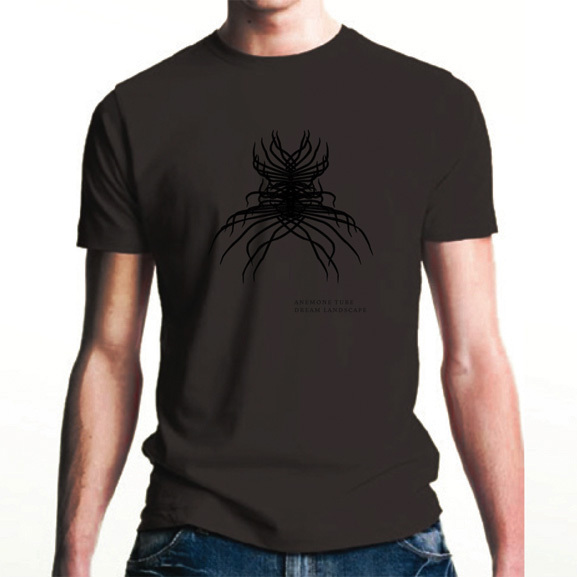 Photography & Graphic Design by Anemone Tube 2007/2012. Guanyin Bodhisattva (“Goddess of Compassion”), 21-meter high bronze statue, Longxing Monastery, Shijiazhuang. “This Dismal World” is a dark concept album about the ‘Four Nobel Truths’ – the central teachings of Buddhism explaining the nature of suffering (dukkha). 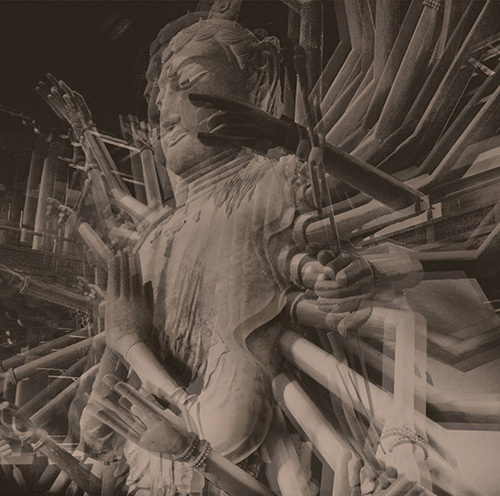 Legendary cult industrial act Dissecting Table from Japan and Germany’s dark ambient/industrial project Anemone Tube join forces to perambulate the stony path of the four noble truths: suffering, its causes, the possibility of its cessation and how it can be overcome. With the use of field recordings exclusively made in a mausoleum in China in 2007, Anemone Tube gains insight into the first truth of suffering, the impermanency of all forms of life and the inevitableness of death. “In The Mausoleum“ is a dark industrial epic conjuring up a sinister, threatening atmosphere. With the crushing power-electronics track “From Anthropocentrism To Demonocentrism”, based on field recordings made in buddhist temples in Nanjing and Shanghai, Anemone Tube consequentially confronts the listener with the origin of man`s craving for sense-pleasures and self-perpetuating egocentrism. 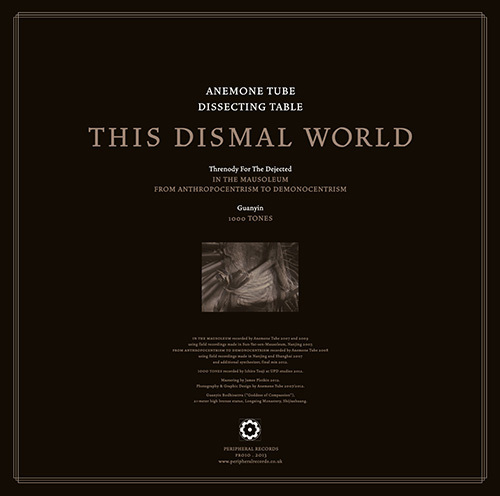 “Ebenso wie die letzten hier besprochenen Veröffentlichungen von Anemone Tube ist auch diese Split-LP mit Dissecting Table stark konzeptionell ausgerichtet: So geht es auf dem Album um die vier edlen Wahrheiten, die das Fundament des Buddhismus darstellen. Diese lauten, dass das Leben leidvoll ist (vgl. den Titel des Albums), dass die Ursachen für dieses Leid(en) u.a. Hass und Gier sind, die Auflösung dieser Ursachen das Leiden zum Erlöschen bringen kann, und dass man dies durch den edlen achtfachen Pfad schaffen kann.